Jade Haines is looking to build on a successful first year junior in 2016 as she targets further success in 2017. With a rainbow jersey in the individual pursuit at the Junior Track World Championships her main goal. 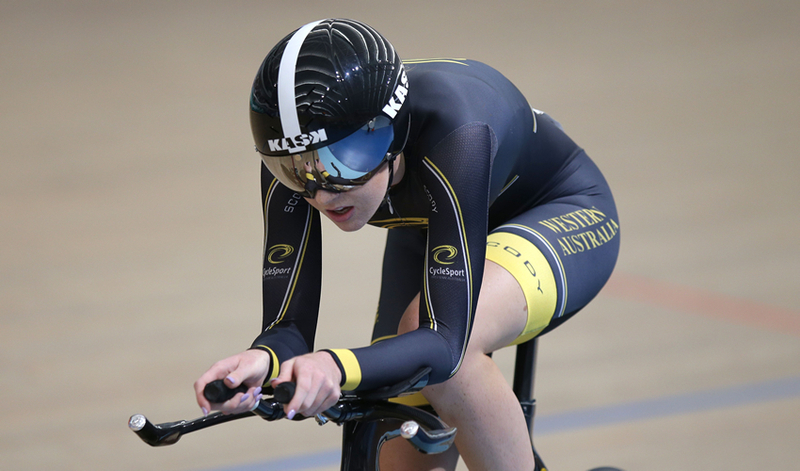 The now 17-year-old shot to attention in 2015 when she set the second fastest time by an Australian in the under 17 individual pursuit, nearly beating a time that was set before she was born. In her first year in the under 19 ranks Haines claimed Australian titles in the individual pursuit and scratch race, adding medals in the omnium, keirin and team pursuit. A silver medal in the individual pursuit at the Junior Track World Championships with a new personal best added to her medal haul and served to motivate her further to claim gold in 2017. It was in the Madison at Junior Worlds where Haines wrote her name in to the history books, when along with Ruby Roseman-Gannon she won the first ever women's Madison at world level. Haines returned to competition at the Oceania Championships in December claiming gold in the omnium and scratch race among a five medal haul. While Haines may have sat out the individual pursuit at the Oceania Championships to focus on improving her bunch racing skills, she still has big ambitions in her pet event starting with the defence of her title at the Australian Championships, March 2-5. What did it mean to selected in the Australian Team for the 2016 Junior Track World Championships? It was an honour, I had worked really had to achieve that goal and was proud to represent Australia for the first time with such a strong team to support. Heading in to Junior Worlds what were your goals? Making the team as a first year, my goals were mainly around my own personal growth and PBs, to get the experience for the other events to come. Qualified third fastest in the team pursuit and were in contention for the medals but finished seventh in first round. How did the ride go? We defiantly had it in us to get on that podium, but it just wasn't our day as a team unfortunately, but we raced the best we could against some very strong teams. After the disappointment in the team pursuit was it hard to refocus for the individual pursuit? No actually, the disappointment made me hungrier to achieve my goal that I wanted. Qualified second fastest in a new PB. What was the plan for the final and what did it mean to win silver? I was pretty surprised to have qualified second with my PB time, considering the strength of the field I was up against. The plan in the final was just to back up as well as I could and try and race my competitor. Like I said I was surprised even to qualify for a medal, so getting the silver was unbelievable such a good feeling to be up there standing with such talented girls. Is there a bit of disappointment in not winning gold? Does that motivate you to come back in 2017 and chase gold and the rainbow jersey? When I had the chance to win the gold but came away with the silver its certainly made me hungry and watching the rainbow jersey being given to Russia. It's definitely made me motivated for that win and top step. You then raced the Madison what did it mean to win the first ever women's Madison at world level? The Madison was my highlight of the Worlds experience. Such a buzz to race it at a world level. Winning with Ruby was such a cool moment and I hope that I can do it again this year. Oceania Championships in December was your first major competition since Junior Worlds what was your preparation like and what were your goals? We focused on bunch racing after the changes to the omnium, leaving my training for the IP for nationals. My goals were just to race really well thought out races, using good tactical plays, which I felt I did well but there is always room to tweak. Started with silver in the team pursuit, points race and keirin were you happy with your performances? Did it start to get frustrating to be so close but just miss gold? The teams pursuit silver was a good result for a team that had trained twice together, it is definitely something we can build on as a team if we get to race together again. The points race was frustrating only missing that gold by a bit but it gave me something to chase for the next points race later in the week. As for the keirin it wasn't an event I practically train for so I will take what I can get against those sprinters, always good to feel under the pump. A close omnium that went down to the final sprint in the points race. How did the omnium play out for you and what does it mean to be the Oceania Champion? The omnium started me with a placing in the scratch race that was going to make it tough to get the win I wanted, especially with the changes to the event. But I took each race as it came building up on points until the points race. Unfortunately just before the last sprint in the points race Ellesse Andrews crashed out with a fellow New Zealander, giving me the win not the best way to win a title but I still worked just as hard and am proud to have that title. Then picked up gold in the scratch race for two gold and three silver from five under 19 events. A great start to the season were you happy with your results? I started a bit rough but definitely built into the events tactically and am happy with the results that I can build on and improve. It was good to come back and have tough competition, it will make for a very strong selection team and I am looking forward to racing the girls again at Nationals. It was a quick turn around for Omnium Nationals after silver last year and the Oceania title you obviously had high ambitions? Finished fourth just missing the medals how did the four events go for you? I am disappointed with my result I thought I could have performed better, but the girls rode really well and had me under the pump from the beginning. A lot of learning came out of the event surrounding recovery and tactical plays. What do you think about the changes to the format of omnium? I wasn't that excited about the changes when they first came out, because l loved the sprinter component that it brought to endurance racing. But after racing it at Oceania Championships I had learnt to adapt and found it enjoyable in the end, the fast turn around and intense one day of racing makes for interesting plays and exciting racing. Track Nationals in two weeks what are your goals? As always I am going for that gold in the IP as my main goal, and hopefully following that up with other podiums in the scratch and points races. I am going to do the keirin as well as an added race for some more fun. Hopefully from those performances I come away with a spot on the junior worlds team again which is the main goal. Looking further ahead in 2017 Junior Track Worlds the big target for you? I definitely want to get back onto the Australian team again, being in that environment with the other top riders of Australia is ultimate lifestyle, I hope I can be apart of that again. To put the green and gold back on and win Australia a gold in the IP and maybe even go back to back in the Madison would be an amazing way to end my junior campaign.